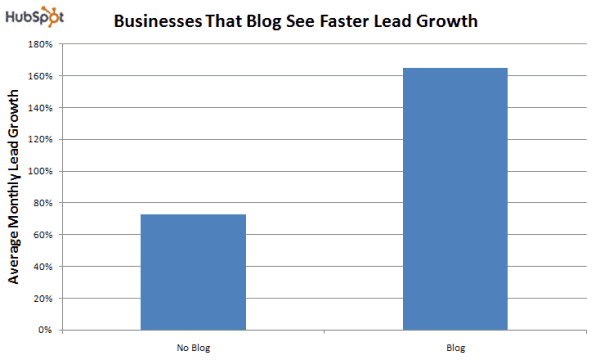 Blogging is a valuable tool for all online businesses and that includes ecommerce stores. Through blogging you can increase traffic coming to your website either organically (search traffic) or from social media networks. It’s great for brand awareness, customer support and if done correctly, rankings and conversions. Why should all ecommerce websites have a dedicated blog? There are many reasons as to why all ecommerce websites should have a dedicated blog. Many ecommerce owners believe that it’s a waste of time, but as we will see below, a successful blog can assist in the growth of an online store and in many ways, guarantee long term success. Run campaigns on AdWords or Facebook to get traffic and make sales. While this is a good plan, once they stop putting money on advertising or for various reasons advertising costs increase making the campaigns not profitable, sales drop and problems rise to the surface. This is the point where they start looking for alternative ways of getting traffic, and soon they realize that putting all their eggs in one basket was not a very good idea. The thing is, blogging can be an alternative way to get traffic to a website but it’s not as immediate as AdWords or Facebook Ads. To take advantage of blogging, you have to plan for it in advance. Any money you spend on setting up a blog or publishing content will not generate any returns in the short term but it’s one of the best investments you can do for your businesses in the long term. It takes a lot of time to rank in Google and get traffic to your blog but it’s a step you have to take and the sooner you take it the better it will be. 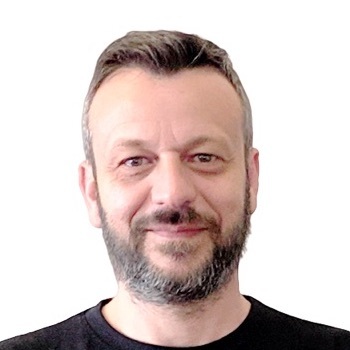 Over the years I had the opportunity to SEO Audit a number of ecommerce websites, both new startups and mature businesses, and it always comes to the same advice. Don’t spend all your advertising budget on ads. Allocate at least 20% of your monthly budget on content marketing and blogging and increase that gradually until you reach of point where the dependency on Paid advertising is manageable. The Internet is changing rapidly, advertising costs increase and competition is becoming more intense in all niches but one thing is for certain. A well-planned blog with high quality content is likely to attract traffic from search engines and social networks for years to come. Ecommerce websites tend of have a lot of pages (products, categories, tags) but many of them carry the same content. While this is not necessarily bad for SEO, it’s not good either. Category and tag pages have the same content as product pages, the same products may be available on other websites on the Internet and this creates duplicate content issues. Besides optimizing your category and product pages, another way to increase the number of unique pages search engines have in their index is through blogging. More quality pages in the index, means better rankings and more traffic. When you start a link building campaign to improve the rankings of your shop, you will soon realize that other bloggers or websites are not willing to link to your homepage or product pages. Why is that? Because nobody wants to promote a product for free (unless they are affiliates or have other benefits), and because they are afraid of getting a Google penalty (if Google thinks that the links were paid for). So, how do you get out of this loop and build natural links that can increase the rankings of the most important pages of your store? The answer is through blogging. Everybody is willing to link to high quality pages, even if these pages are part of a website selling goods or services online. Ok, but the links will point to the blog, how will this benefit my website? In a number of ways. For starters, it will improve the authority of your domain and it will increase the overall rankings and traffic of your blog. Second, as we will see in a new post dedicated to link building, there is a way to take advantage of the incoming links to boost the rankings of your product or category pages. One of my favorite SEO methods is internal linking. Internal links are links pointing to other pages of your website (and not to pages outside your domain). Unlike external links, there is no fear of Google penalties and besides being useful to users, they also help search engine crawlers discover and index more pages from your website. Having an active blog is a great way to build internal links pointing to your homepage, category and product pages. Social media marketing is essential for ecommerce websites. Having a solid presence in social media networks is a good way to promote your brand (awareness) and products. To be successful in social media, besides using paid ads, you also need to keep your accounts loaded with fresh, high quality content and a blog is the perfect tool for that purpose. Enrich your blog posts with images and videos so that they are more interesting and attractive when shared by users. 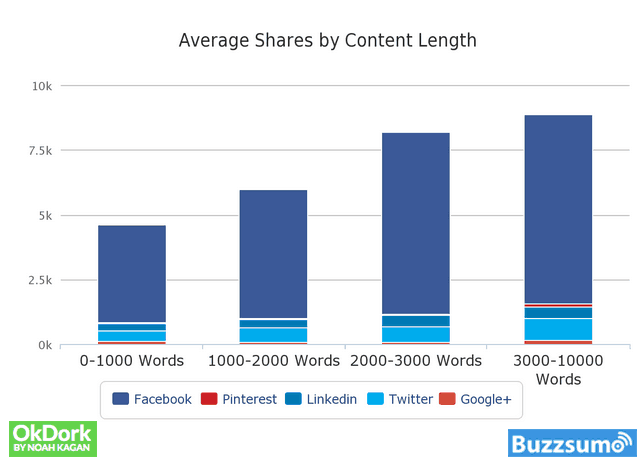 The graph below, shows the different types of content and their average shares in social media networks. An active blog can also be used for customer care and support purposes. Use the blog to cover topics related to your products that your users might have questions about. Use the blog to make new product announcements and establish a communication channel between your company and customers. Before making an online purchase, users need to feel confident that they will not lose their money, so one of the things they do before hitting the “Buy Now” button, is to search Google and find out more details about the particular company. If you have a blog, then it is very likely that a number of posts will show up for searches related to your “brand name” and this besides indirectly promoting your brand, it helps in establishing trust. How to setup your ecommerce blog? There are many ways to setup a blog, depending on the ecommerce platform you are using. If you are already on WordPress and Woocommerce then adding a blog is a very easy task since this is already build in to WordPress. If you are not using Woocommerce, you can still setup a WordPress Blog as a subdomain i.e. blog.myecommercewebsite.com or folder myecommercewebsite.com/blog. What is important is to use one of the two versions above (i.e. subdomain or folder) and NOT to setup a blog on its own domain. The reason is that you want to take advantage of the pages/posts of the blog and increase the number of pages you have in the index and of course to consolidate the link juice from any incoming links pointing to the blog pages. Hint: You can read my detailed guide on how to setup a WordPress Blog to get started in minutes. Make sure that https is enabled on the blog. Your ecommerce website should already have an SSL installed and the should be true for the blog as well. You don’t have to create all the categories that you have in your website as blog categories. Your blog can have a structure that makes sense for a blog. Do optimize your blog category pages though, they are important for SEO. 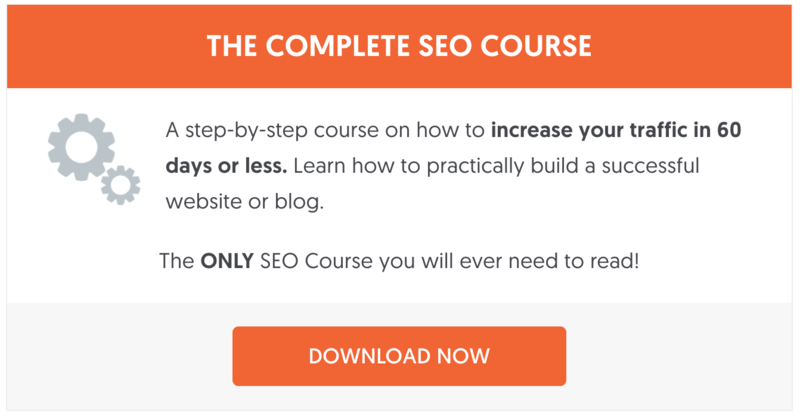 Follow all SEO best practices for optimizing a website, as described in The Complete SEO Guide. Don’t forget to add a BLOG menu in your main menu, sitemap and footer. 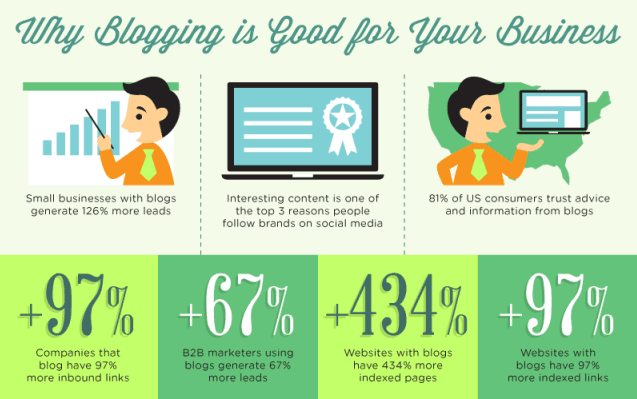 People are familiar with the term Blog and many times they are searching for it. Hint: Look at my blog and see the various CTA’s I have for redirecting interested users to my services and ebook pages. Add the appropriate schema data to your blog post (schema.org/article or schema.org/review depending on the case). Add support for Accelerated Mobile Pages for the blog. AMP blog posts have more chances of appearing in the Google News Carousel. 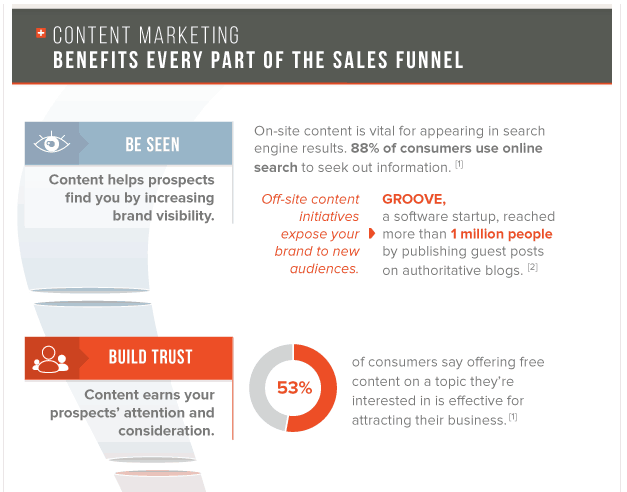 This can give you an advantage, especially if you publish posts related to product reviews. What you should blog about? That’s a very interesting question and one of the most common questions I get from ecommerce owners when performing an SEO Audit. Regardless of the niche you are in, there are always topics to cover in your blog. How do you find them? If you have done your keyword research correctly, you should already have a list of nice long tail keywords you can target in your blogs. 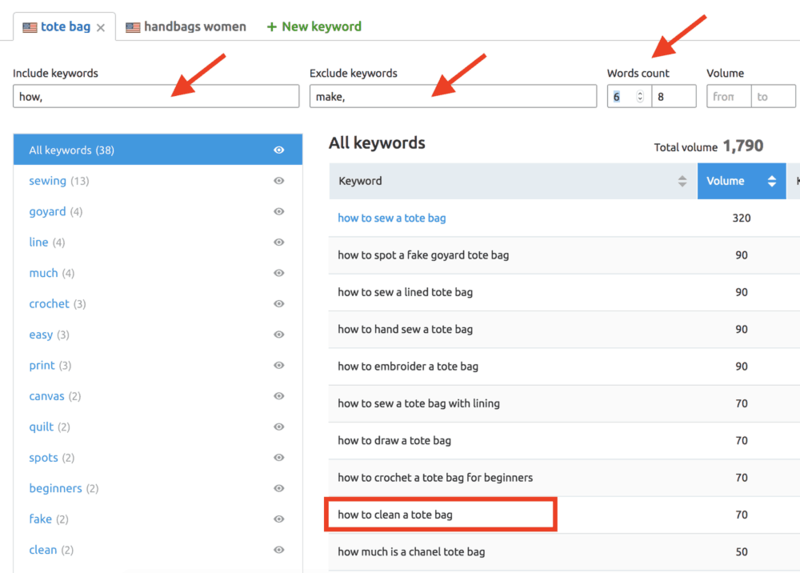 Look at the example below, and make sure that you read section “Keyword research for ecommerce blogs” in my keyword research for ecommerce post. Tools like SEMRUSH (shown in the above screenshot) will make this process much easier and more effective. Checkout the blogs of your competitors. What topics do they cover in their posts? What kind of content do they publish (text, videos, etc)? How often do they blog? Of course, you don’t want to copy their exact titles and content but knowing how they are utilizing blogging can give you some ideas too. If they don’t have an active blog then this is even better, it means that by maintaining a blog you will be a step ahead. Most people before making a purchase decision they like to read product reviews, how-to guides, comparisons with other products and other related information. 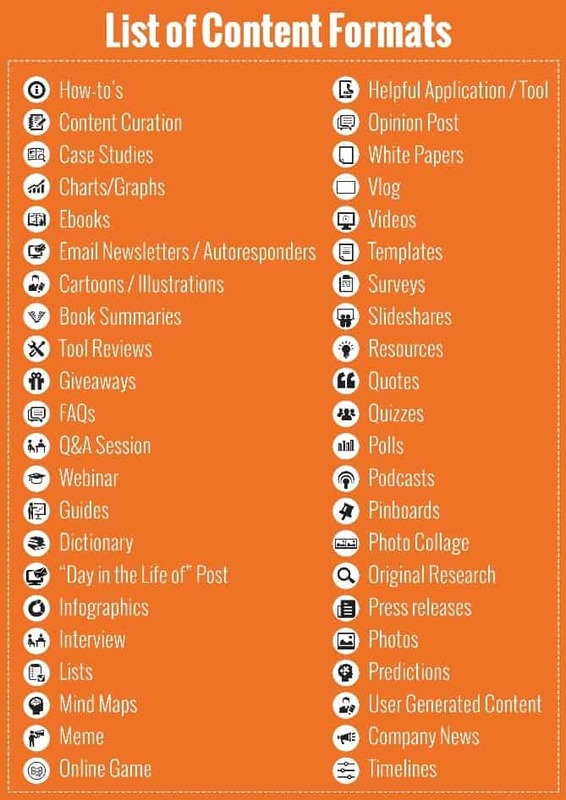 These are great topics for blog posts. You can write in-depth guides with nice videos showing how your products can be used or how they compare with other similar products. The reason is simple, you want your blog posts to appear high in search when people search for reviews of the specific product. One of the concerns many people have is that Google will not rank reviews published on the blog of an ecommerce website selling the products. Google knows that the review is published on a website selling the product but good product reviews can still rank high. If you follow some basic rules on how to write SEO Friendly content, these posts will also show up for terms like “your brand name – Reviews” and this has a lot of advantages for your brand’s reputation. People love to read success stories and your company blog is a great place to share your story with your audience. Story telling is another opportunity for you to promote your brand and build trust with your potential customers. For example, let’s say that you have an ecommerce website selling custom made rings (which is a highly completive market dominated by giant companies). You can publish a story on your blog on how you started your business, explain your passion with making custom rings and how happy it makes you to get nice comments from customers etc. Potential customers reading your story will feel more confident to buy a ring from you because any fears they may had about your company, are overcome by your personal story. When planning your blog’s content, don’t think only about text. There are a number of content formats you can use depending on the products or services you are selling. The infographic below shows a list of the most common content formats you can use in your blog. 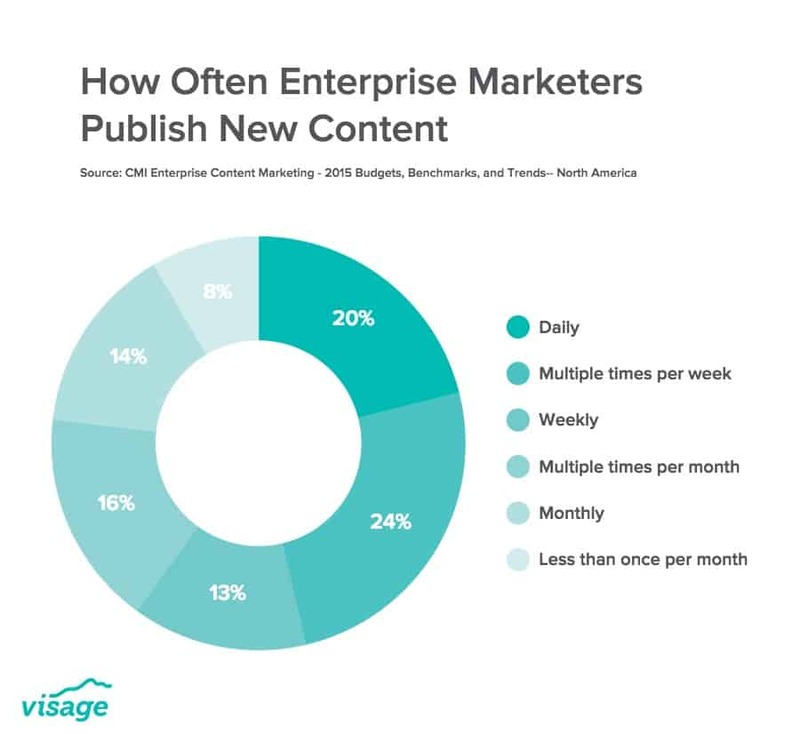 There is no golden rule as to the number of times per week / month you should publish new content. It is proven though that websites that publish content on a regular basis, tend to rank higher and get more organic traffic than websites that don’t publish regularly. Producing good content for an ecommerce blog, is a time-consuming and costly task. If you don’t have a solid process in place it will be very difficult to keep to a schedule. If you are busy running your shop, then the best approach is to either outsource this task to a Digital Marketing Company or hire a good writer and an SEO to handle and run your blog. The SEO consultant can give instructions to the writer as to which topics to cover, what titles to use, how long to make the blog posts and as soon as a post is written, it can be SEO optimized before publication. As a word of advice, don’t set goals with the blog you cannot meet. Start by publishing one post per week and if you can follow this schedule for a couple of months, go to 2 posts per week etc. How Long to Make Your blog Posts? I’m not going to give you a number because it depends on a lot of things, but the longer you make your blog posts the better. 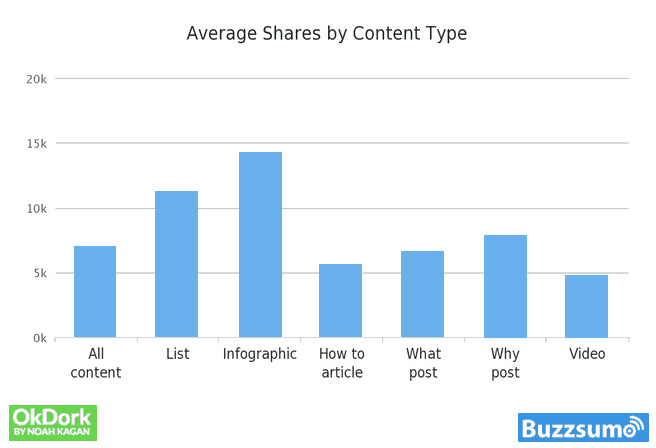 As shown by research, the average number of words of top rankings blog posts is 1600 words and as shown in the graph below, longer posts get more shares in social networks. As a rule of thumb, before start writing a blog post, search Google for the keywords you are targeting with the blog and examine the results on the first place. Your task is to make your posts better both in terms of quantity but also quality. All ecommerce websites should maintain an active blog. When configured and managed correctly a blog can attract organic traffic to the site and can serve as the medium to communicate with your customers. Once you get into the point that it has enough traffic, you can either redirect the traffic through CTA boxes to your product or selling pages or get as many email subscribers as you can and use email marketing to introduce your products and services. If you are still wondering if you should start a blog or not, let me tell you that as a company we get a good amount of leads per month without spending a dime on advertising. Our Blog generates all leads and product sales. Thanks to sharing such a nice article. I have just started my website and wondering how to boost to get organic traffic on website. This article helps me lot to set new plan for my website ..thanks once again.. Thank you for the post! I am a beginner in SEO.I have read many of your post and all of them are really informative.I don’t have any blog yet.But I am willing to create a new blog which will help in promoting my website.This article helped me a lot in getting some ideas. I want to ask one questions. Do backlinks useful if there is no any traffics coming from that link?